I got this dresser last Spring when I stopped at a yard sale. The lady had it shoved in her garage with a lot of stuff on top of it and I asked about it when she let me take a look around. There were rabbits hopping around in there, and lots of very interesting old stuff. All of it was treated pretty much like trash, but I loved the shape of this one. I brought it home and dry brushed it, mod podged some beachy looking paper on top of it, and put it in my bathroom. When it was in there my mother convinced me to use blue paint on it. I did it and I hated it. 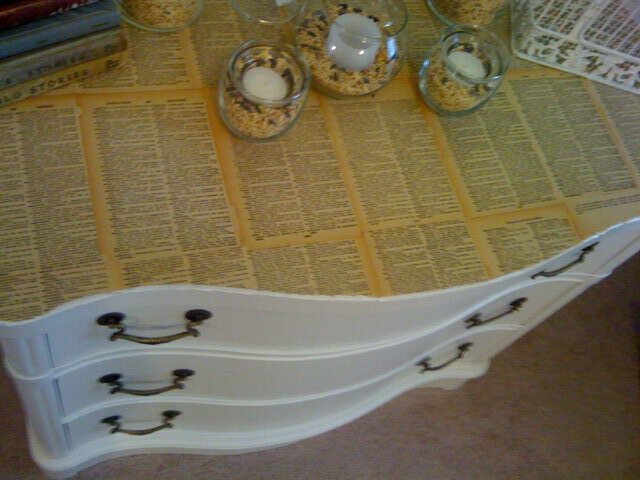 Then I decided I didn't want to leave it in there, so I used Mod Podge and an old dictionary to re-do the top and put it in our bedroom. A few days ago I decided to change it up and paint the whole thing. 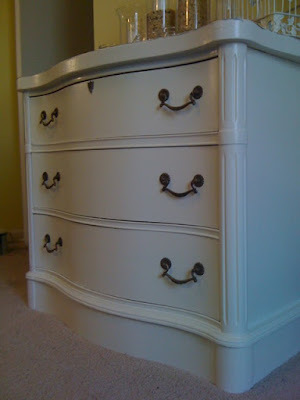 I was going to paint the hardware as well, but once I saw it against the creamy paint I loved it. It's not perfect by any means, but it is perfect for me. Have you done anything you love lately? P.S. While I was at it I painted the birdcage, too. Much better! It's beautiful! Way to go :) I have my mom's old dresser that I keep meaning to redo - and it keeps getting pushed farther down the list! So cool! I love the color of the old pages against the paint. It is so visually interesting. Nicely done! very cute, i love the yellowing pgs of the dictionary. great idea. I like the visible age of that old paper. Usually dictionaries that old have very thin pages. Did you treat your paper before applying the decoupage? Just curious. that looks awesome! i love hte curvy shape of it, and i love that you added the interest just to the top- it keeps it fun, but classic as well. Poindextr, I did not treat the paper first. I just used mod podge. I am considering a treatment to the top to make it more durable, but I haven't decided on one. I soooo love this! It's a gorgeous piece and your dictionary top adds a bit of whimsy! Love the top! Great job! Nice! I really love it. 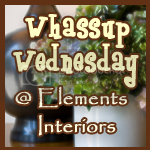 I wanted to thank you for visiting my blog and took a look around while I was here! LOVE the dresser! You did a great job on it!